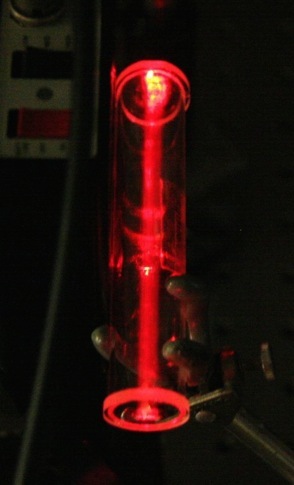 External cavity diode lasers are common tools in undergraduate and graduate laboratories. One can tune and stabilize inexpensive laser diodes (as will be done here) to be used in contexts such as high precision optical metrology and spectroscopy experiments. Their relative ease-of-use, potential for customization, low price, and large choice of wavelengths make them accessible and interesting parts of undergraduate advanced laboratories. Iodine vapor cell. An external cavity diode laser is on resonance with a hyperfine transition near 633nm. The apparatus in this Immersion will comprise components of a home-built external cavity diode laser system: machined mounts, temperature controller, precision current source, pzt driver for fine tuning, etc. Participants will have the opportunity to build, align and tune an ECDL at 633 nm and 780 nm. They will also scan the laser frequency for simple absorption spectroscopy in iodine vapor, with a possible extension to saturation spectroscopy with lock-in detection. 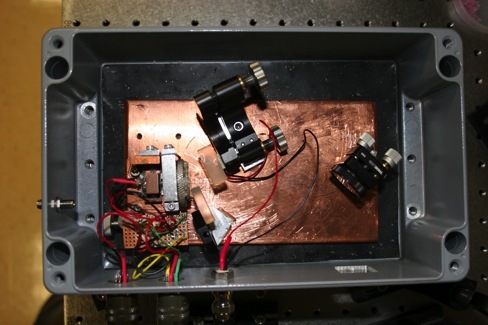 Home-built external cavity diode laser, top view. Versions of this workshop have been offered at the AAPT summer meeting in Portland in 2010, an ALPhA Immersion at Bethel University in 2011, and a workshop at the 2012 ALPhA Conference on Laboratory Instruction Beyond the First Year of College (BFY). At the latter event, a portable version of the apparatus demonstrated resolution of hyperfine features in iodine even in a noisy environment. Participants in this Immersion will be offered schematics and a parts list for a home-built ECDL system based on a NIST design.